I joined Facebook in 2008. I had recently attended one of my mom’s annual family reunions, and heard so many of my relatives were on there. I thought I’d sign up in order to see what they’re up to. I’ve also joined a few autism groups on Facebook. Many of the people in these groups are so proud to be autistic that they even put the first two letters in the word “autism” in their username, either at the end or in the middle. These letters also stand for a movement on Facebook called Autism United, a group dedicated to a positive image for autism online. I was inspired to join in, so I inserted an AU into my username as well, right at the end. Then came a problem. There are trolls on Facebook who are using fake names to set up accounts for their heinous activities. Facebook decided that everyone with a fake name was guilty of trolling, whether they did it or not. (I wouldn’t know the first thing about hacking someone else’s page, for the record.) This resulted in a new policy: fake names would no longer be allowed on Facebook. To Facebook, this included people with suffixes as well, like the AU that I had in my name. This despite suffixes being used often in names like Hank Williams Jr. and Dale Earnhardt Jr. (I think that’s how it’s spelled). This new policy gave cyberbullies a new way to bully others. They sought out people like me who had “AU’ in their usernames and reported many of them. Eventually, I was reported and deleted. When your page gets deleted, you get no notice, not even an e-mail. So, when a bully reported me, I had no idea my page was deleted. All I knew was that my username and password no longer worked. I sent an e-mail to Facebook and got a confirmation code, so I thought that would help. No dice–they only work if your page is still up. After several tries, I finally realized what happened. I was now one of the victims. I had two options. First, I could send Facebook proof of my identification and wait 60 days. 60 DAYS! The second option was to get a new e-mail and create a whole new account. Waiting 60 days was out of the question. I did not want the bullies to think they won. One of the big reasons I despise the notion that autism is a disease is that when you have a disease, people will want a cure. Cures lead to people being desperate. And desperate people will try anything. You would think in an age like today’s, snake oil would be an antiquity of the 19th century. Sadly, you’d be wrong. Meet the Genesis II “Church”. The Genesis II “Church” peddles a “cure” called Miracle Mineral Supplement, aka MMS, AMS, or (and this name angers me the most) Jesus Drops. The Genesis II “Church”, despite its name has NOTHING to do with religion (hence the quote marks I’ve inserted)Yes, it has reverends, but unlike Christianity, these wolves in sheeps’ clothing have no training in the seminary. They just need enough money to bribe for the title. The “Church” was founded by Jim Humble, who appointed himself “bishop”. There’s also Kerri Rivera and Leonardo Avellino Edwards (more on them in following paragraphs) He is, at the time of this post, in his 80’s, and was a Scientologist for 25 years. He claims to have degrees in both Aerospace and Mining Engineering. In 1996, Humble was prospecting in Guyana, when his crew contracted malaria, which he claims to have “cured” with MMS. He also claims it can “cure” Ebola, AIDS, autism, and several types of hepatitis. I’m no medical expert, but I’d be suspicious of something making an outlandish claim like that. Jim Humble also has his own Twitter account. Kerri Rivera lives in Mexico, and like Jim Humble, has no medical experience. She has her own Facebook page and website. These are used to promote a book called Healing Autism. The book recommends a “protocol” consisting of making a child swallow MMS, bathe in it, and giving enemas with it. She claims to have “cured” 140 children, including her own son. There are “testimonies” on YouTube with claimants who have their faces blurred (that should be a tip-off). According to the book, you are to give your child 9-16 doses of MMS (12-16 on days when the child isn’t in school). There are numerous other groups on FB besides hers, some even in different countries. I’m sure many of you have seen the many “ALSA Ice Bucket Challenge” videos all over social media. They have spread information for the cause of a cure for ALS (aka Lou Gehrig’s disease) and made viewers laugh (I especially like the ones made by Tara Strong and Rob Paulsen and Maurice LaMarche) However, they have also inspired a cruel act. A few weeks ago, a group of teens in Cleveland, Ohio coerced an autistic boy into participating in an “ice bucket challenge”. The boy soon discovered that the bucket did not contain ice or water. Instead, the bucket contained feces, urine, and spit. The teens then made one big mistake: they uploaded this to Instagram, where few, if any, mature people laughed. The boys have their names withheld and are now most likely doing community service. I am angry about this, but not because the boy was autistic. Before I was diagnosed with Asperger’s Syndrome, I spent years in Special Education classes. From the students in these classes, I learned that they deserve respect and dignity. This act showed neither respect nor dignity. Some have called it a prank. No, a prank is a cream pie to the face. This was a well-crafted, meticulous assault. It is the fruit of the same tree as parents like Kelli Stapleton who abused and nearly murdered her autistic daughter, Issy Stapleton (she later plea bargained the charges to abuse rather than first degree murder). 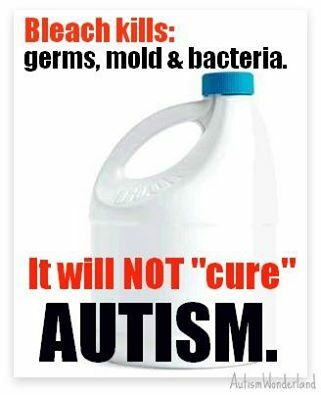 It is the same hatred that allows quacks like Jim Humble and Kerri Rivera to promote their Miracle Mineral Supplement “cure” for autism (which is actually chlorine dioxide, a bleaching agent. I wish I made that up. Yes, they are promoting making your child swallow bleach or giving them enemas with the stuff). These are acts of hatred, yet they can not be prosecuted as hate crimes because hate crimes are only limited to races and religions. These are examples of ableism, social prejudice against those with disabilities. They should not be tolerated.